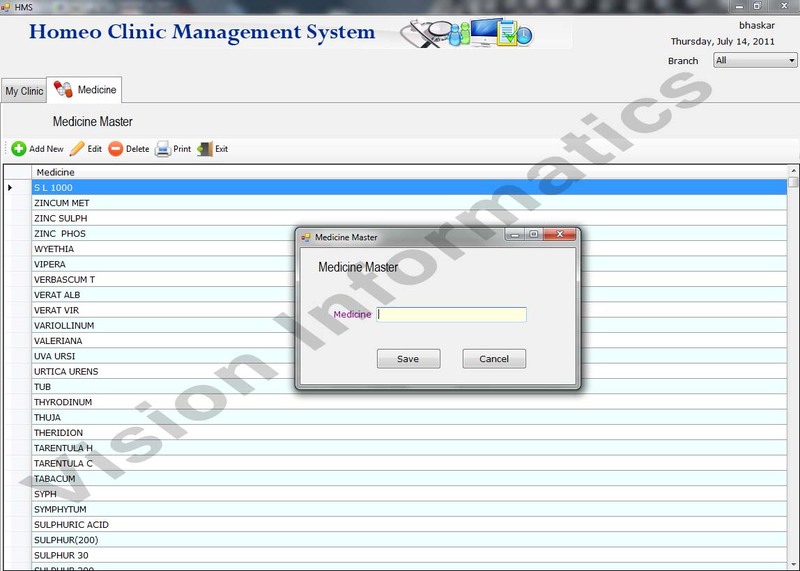 To add new patient click on New Patient and then click on Add New button. To edit patient click on Edit button. To delete patient click on Delete button. To view the visits of patient click on Visit button. 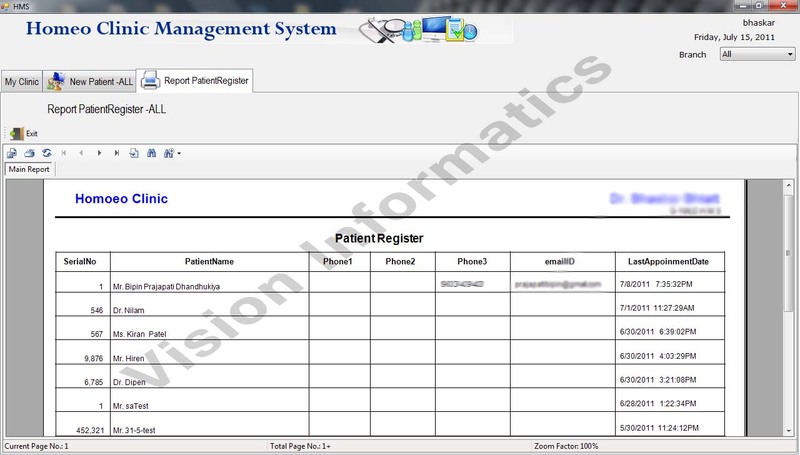 To print the patients report click on Print button. To exit this window click on Exit. 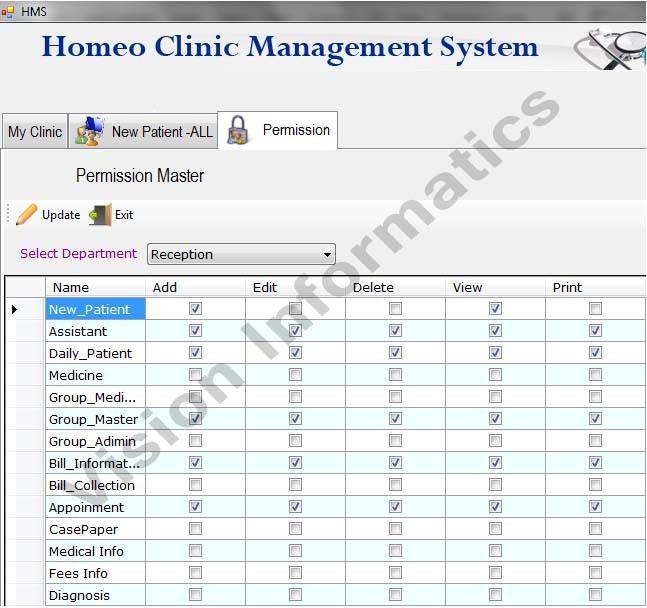 This application is compatible to collect & record huge amount of data of patient. 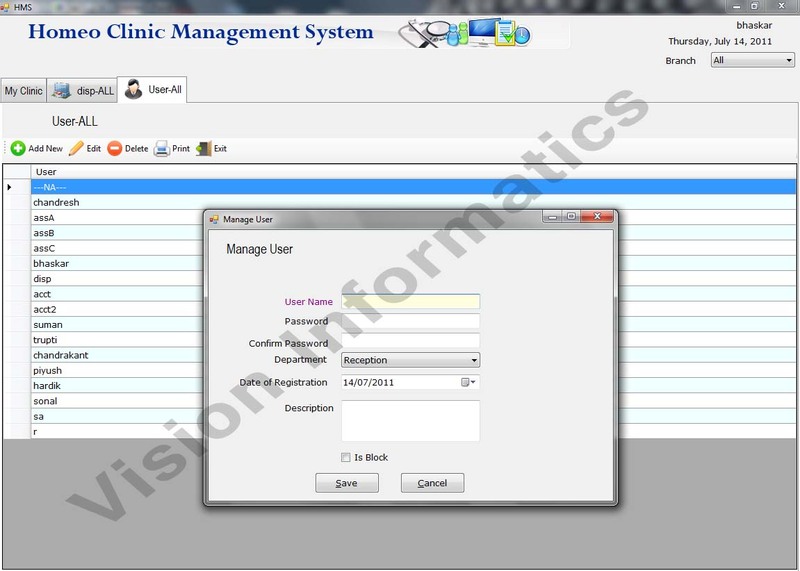 So, Client can assess the information of any patient anytime as, all patients (multi branches) will be recorded & stored in central database with their detailed information. Every appointment of same patient will be recorded in application, lead to create history of patient in form of information or treatment given to them. This history will be helpful to client (doctor) in his practice. Every patient’s medical Information in form of medicine & its potency will be recorded in the application. So when patient take next appointment, doctor can treat patient keeping their historical medical Information into consideration. This application will give information about financial status in form of Date wise cash collection, client pending collection, along with discount facility. This application is having case paper facility, which Smoothen the practice of homoeopathy. Again it will be serving as historical information of patient so, whenever patient take next appointment that same case paper can be refer by doctor during treatment. 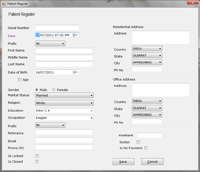 Using this application Admin Person will be able to create different users, and can give permission to every user depending on their requirement. 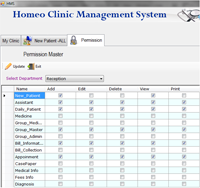 So, User can use the system with limited functionality according to requirement of their task. This is desktop application so there is no dependency on internet. Again this application is user friendly as its very feasible to data entry operator who can work on system by limited use of mouse & more using keyboard. Navigation of application is with the help of presentation of Icons. This application has facility of fees module. 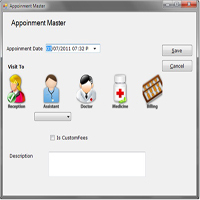 Using this module client can be able maintain standards of their charges for consulting patient; charges of medicine for Specific duration like for 15 days, 1 month, etc. These charges directly reflect in to patient’s bill generated through system. 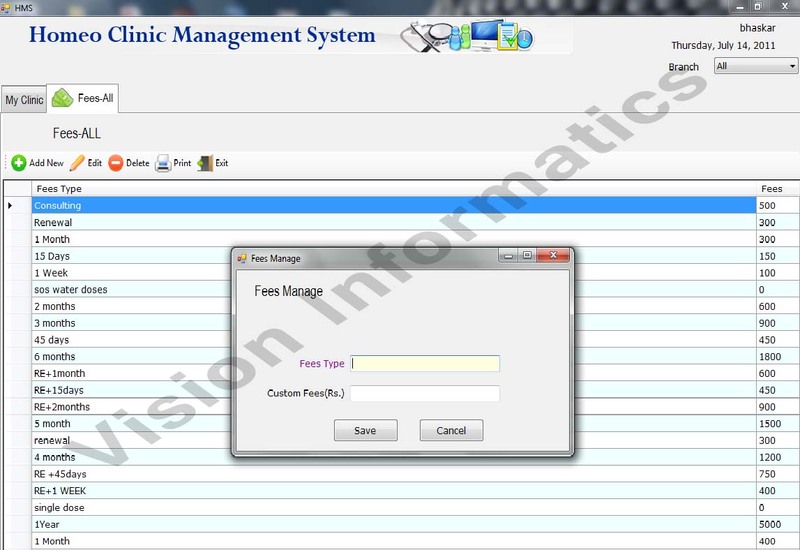 Facility of Customized charging according to patient is also available in this application. 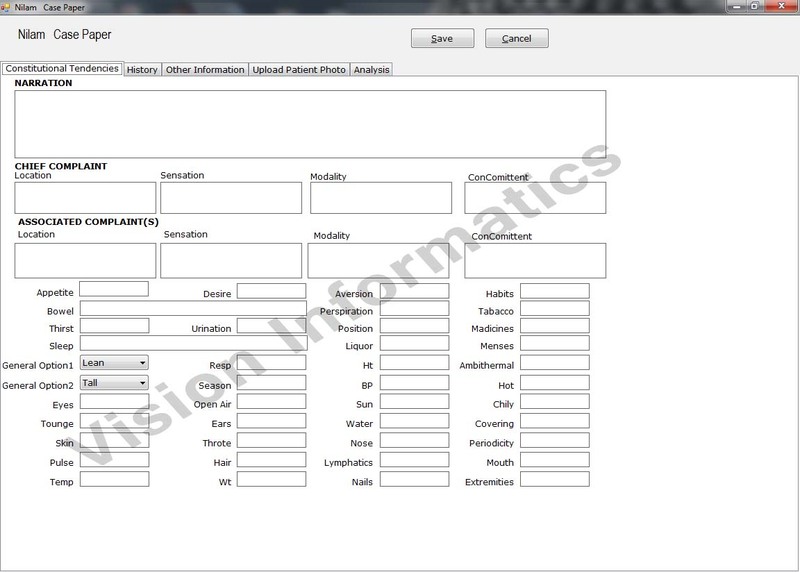 Patient registration report can be generated by selecting range of date like weekly, monthly & according to requirement. Case paper can be generated during first consultation and same can be useful as a history of patient and can be printed also if required. Admin person or Doctor will be able to generate report of all assistants, as number of patient visited to each assistant and can do comparative of all assistant, and also compare it with total number of patient. 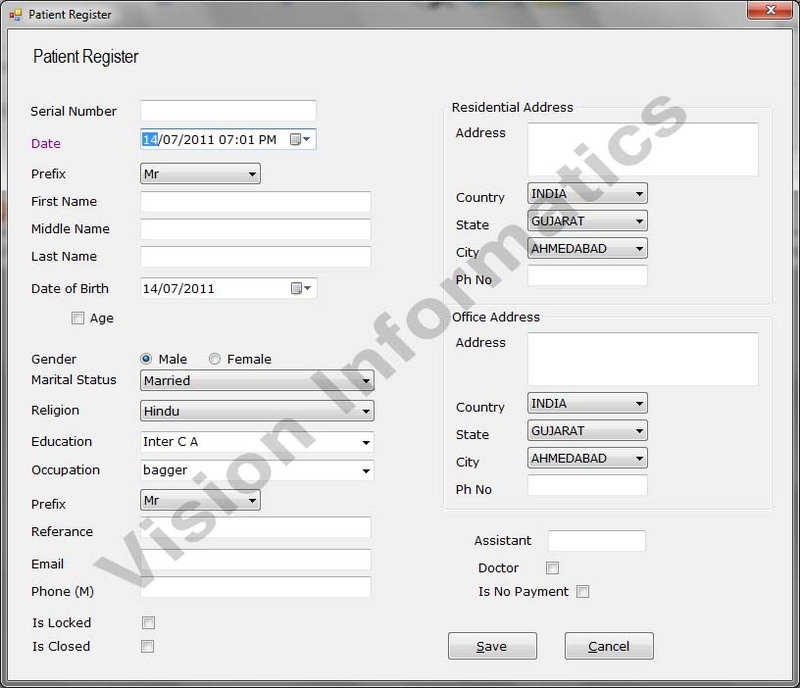 Bill of every patient can be generated through this application in which billing information can be viewed. Date wise Bill collection report can be generated by selecting range of date like weekly, monthly & according to requirement. And it will also show pending collection of patients. Using this application Receipt of collection can be generated and print of it can be provided to patient.